A FormCollection Object is used to retrieve form input values in action method. In the previous chapter, I have explained 4 different ways to create form and gather form data in action method. FormCollection object makes programmers job easier and forms data can be easily accessed in action method. Step 1: Create a New ASP.NET MVC Project or open Existing Project. Step 2: Create a new Model StudentModel.cs and add the following code in it. Step 3: Go to Views Home Index.cshtml and add the following code to create form. Step 5: Run your Project. 2. In Submit Action Method, I have initialized FormCollection object fc. 3. FormCollection value can be accessed either giving input control "id" or index number. 4. If you will not split Boolean value then you will get "true, false" both output, that's why I have gathered checkbox value in Boolean type variable and split them. In this chapter, I tried to teach you FormCollection object with an easy and complete example. 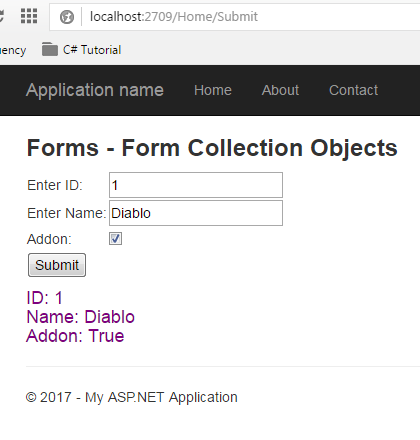 In the next chapter, you will learn Form Validation Techniques in ASP.NET MVC.